We are facing a moral crisis. Cities pursuing higher tourism revenues and greater economic development have declared a war on their poor residents. Unfortunately, it is perceived that those who are living without homes effectively “taint” the scenic vistas and make visitors uncomfortable. More than ever, tourism hot-spots are targeting people who are homeless by passing laws that force them to the outskirts of town or into jails. Popular destinations often treat these individuals like riff-raff and criminals, arresting them for menial crimes in an effort to keep them from unconsciously photo-bombing a couple’s photo of their trip. When the economy is so reliant on tourism dollars, it is natural for a local government or tourism board to take complaints seriously. Often times, tourists complain that they feel unsafe or uncomfortable around homeless individuals. The reputation of a destination can be tarnished so quickly, it is almost remarkable to see how agile governments can be in responding to economic threats. They generally first introduce bans to keep people from sleeping in the most visited parts of town. Sometimes they will open up a resource center far from the center of town to try to lure homeless people away from the hot spots. Sadly, more often they will enact numerous so-called “quality of life” laws that they can use to round up and jail homeless individuals in periodic sweeps. Some examples of laws that are in place are bans on sitting on a sidewalk or sleeping in a park, bans on begging or panhandling, and prohibition of the use of blankets, chairs, tents, pillows, etc. We all know the detrimental impacts a criminal record can have on the futures of low-income individuals. Being locked-up can preclude a homeless individual from ever being able to find future employment or stable housing, leaving them exposed and likely to get swept up in this broken system all over again. These efforts even extend to those who are trying to help. 39 US cities actively punish individuals and groups that operate food-sharing programs, trying to offer their homeless neighbors basic sustenance. In Fort Lauderdale, Arnold Abbott, a 91-year-old World War 2 Veteran who has been running a food-sharing program twice a week for 24 years, has been wrapped up in these issues for years. Despite a court victory in the 1990s, protecting his religious freedom to feed those in need, he has received three court summons since the passage of the City’s latest anti-homeless law in October. With the threat of $1,500 in fines and up to 180 days in jail, he continues to support his homeless neighbors, acknowledging the importance of a consistent program that meets them where they are to minimize the challenges associated with receiving proper nutrition. He maintains that he has the constitutional right to continue preparing meals and will continue to do so despite any personal consequences. When showing compassion becomes illegal, we know we have a serious problem to tackle. The perception of poverty in places like Fort Lauderdale is so tainted with generalizations and assumptions that almost no person who is down on his/her luck has a chance. Communities that pass these inhumane laws are not apt to take proactive solutions and give people a chance. They react to bad stigmas and punish people for trying to survive. If we cannot appeal to them on a human level, we must take a broader stance and try to communicate just how little we stand for this type of injustice. We must make these cities feel the consequences of these inhumane actions. We at the National Coalition for the Homeless are calling on all conscientious citizens to pledge that they will not invest in this kind of discrimination. Our expectations of poverty-free clean beaches are unrealistic and encourage unjust practices. Recently, we have seen increased interest in eco-tourism and other forms of environmentally sustainable travel; the time has come to support conscious consumers who elect to travel to respectful and compassionate destinations. As tourists, we must all put people first and consider the human consequences of our decisions. Fort Lauderdale has been one of the most egregious culprits. The city rapidly passed the largest number of bans in one year that I have ever seen, culminating with its infamous food-sharing restrictions. In the uproar, following the City’s decision to essentially ban compassion, thousands of individuals have stepped up and taken action. 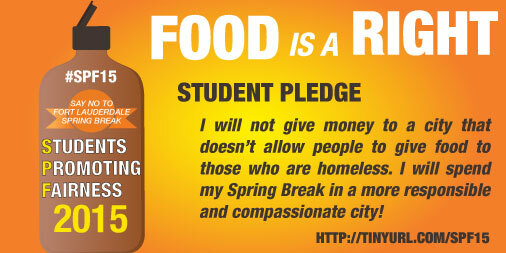 College students have pledged to not spend their spring breaks in this town that mistreats its do-gooders and its vulnerable citizens. They are committed to selecting destinations with more moral integrity. We hope that companies too will vow not to host meetings in a place that has arrested a ninety-one year old on multiple occasions for sharing food with the homeless population. We will all choose fairness over everything! Spring Break is right around the corner and it is on all of our minds. Will you join your peers and flock to warmer climates and sandy beaches? We all deserve some time off to relax and turn off our brains. But while I’m still studying away, I’ve been thinking about how my decisions as a consumer impact the town I’m visiting and the people who live there. I’m willing to drop a cool $100 for a view of the beach, but at what human cost? Are drinks by the pool and tickets to concerts the only cost of spring break? Many vacation and spring break destinations compete for our business. For them, reputation is everything, and unfortunately being nice to homeless people isn’t exactly a trait we tourists are often looking for. For that reason, cities introduce ordinances to keep the streets clean of all visible reminders that poverty exists. They don’t want us to share food with the homeless people near our hotels, beaches and restaurants. They don’t want us to see a man sleeping on the park bench or a mother and her child asking for money on the public transportation system. Public lands near our vacation hot spots are no longer a place of rest for the homeless. New laws passed by cities throughout the country ban sleeping outside, asking for money and prohibit private citizens from sharing food with the homeless. 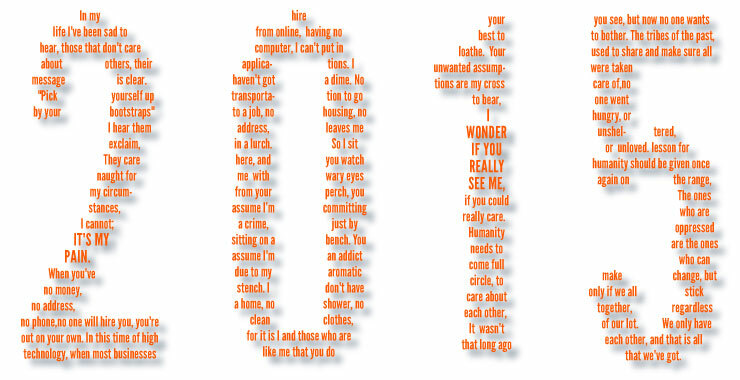 These ordinances make criminals out of people who are homeless. The most outrageous thing is that they are even punishing the people who are trying to help the homeless! Fort Lauderdale is one mean city that continuously threatens people with massive fines and jail-time for feeding others in public spaces. The city wants them to move indoors and out of sight, not considering how difficult it is for the homeless people to get around the city to all the many places they must go to try to get help. Do you really want to go to a beach that only allows people who can afford a $14 daiquiri to enjoy the view? I don’t – and I know what I am going to do about it. I won’t give them my business! I will not condone a city starving its most vulnerable residents for my sake. I will not visit Fort Lauderdale until they repeal the cruel food-sharing ban. Instead, I pledge to support cities that work to end homelessness by creating affordable housing, job training programs, access to affordable health care and an increase in the availability in public assistance. Be a Student Promoting Fairness! Pledge #SPF15 this spring break and make your week mean something! Don’t let cities profit from discrimination and criminalization of the homeless! 2015 is a year to take action! those that don’t care about others, their message is clear. they care naught for my circumstances, I cannot; It’s my pain. no one will hire you, you’re out on your own. having no computer, I can’t put in applications. I haven’t got a dime. No transportation to go to a job, no housing, no address, leaves me in a lurch. You assume I committing a crime, just by sitting on a bench. You assume I’m an addict due to my aromatic stench. For it is I and those who are like me that you do your best to loathe. I wonder if you really see me, if you could really care. It wasn’t that long ago you see, but now no one wants to bother. No one went hungry, or unsheltered, or unloved. but only if we all stick together, regardless of our lot. We only have each other, and that is all that we’ve got. and let the planet heal from our wars on each other, and be better humans once again.